Characteristics, Dating, Types, Chronology of Gwion Aboriginal Art. See also: Oldest Stone Age Art.  Who Painted the Bradshaw Paintings? In the field of Aboriginal Rock Art, the term "Bradshaw painting" or "Bradshaw figures" refers to an extraordinary tradition of Kimberley rock art practiced in the north-west region of Western Australia, with parallels in Arnhem Land in the adjoining Northern Territory. Named after Joseph Bradshaw (1854-1916) who was the first European to encounter them in the 1890s, Bradshaw pictures consist mainly of small, long-bodied, human figures, wearing accessories such as headdresses, tassels and dilly bags and carrying spears and boomerangs, and have long been acclaimed for their elegant highly distinctive style - notably in the amount of figurative detail and the technical skills of the artists. Indeed, Bradshaw paintings represent, arguably, the most beautiful and famous style of prehistoric art on the continent of Australia. No one knows who painted the Bradshaws, or when, and over what period, they were created, which only adds to their mystery. In any event, Bradshaw paintings are not the earliest art of the region. The oldest known Bradshaw painting in the Kimberley is a "tassel" Bradshaw dating to about 15,500 BCE, but later Bradshaws might have been produced as late as 3,000 BCE, coinciding with the start of the Wanjina rock painting tradition, the final type of Kimberley art. In contemporary Aborigine society, Bradshaws are known by a variety of different names, including, "Gwion Gwion", "Giro Giro", "Kiro Kiro", or "Djaeneka Djaeneka". 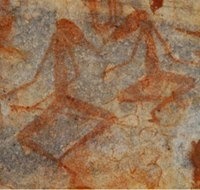 During the 1980s and 90s, Bradshaw pictographs were intensively studied throughout the region by Dr. Grahame L. Walsh, who criss-crossed the vast lands of northern Australia in search of Stone Age art, taking tens of thousands of photographs and compiling a mass of meticulously researched data that made him the world's leading expert on Kimberley rock art. He was also renowned for two seminal books "Australia's Greatest Rock Art" (1988), and "Bradshaws: Ancient Rock Art Paintings of North West Australia" (1994). Unfortunately, Walsh was over-influenced by the apparent "cultural uniqueness" of Bradshaw pictographs and petroglyphs - largely because the style emerged fully-formed, as if imported from abroad, and because it bore little resemblance to the Wanjina tradition that followed. As a result, he refused to believe that Bradshaws were created by the ancestors of present-day Aboriginal people, a viewpoint which was both provocative and unjustifiable, although it should not be allowed to obscure his invaluable contribution to our understanding of the Bradshaw tradition. Note: the recent U/Th dating of the Sulawesi Cave art (Indonesia) to nearly 38,000 BCE, proves conclusively that aboriginal artists were capable of creating beautiful art in the earliest period of the Upper Paleolithic, well before the advent of the Bradshaw style. As stated above, Bradshaw paintings are not the oldest art of the region. In Western Australia and Northern Territory that honour belongs to "cupule art" - that is, deeply weathered cup-shaped hollows called cupules - followed by a tradition of cave painting featuring mainly animal pictures, along with some handprints and hand stencils, as well as abstract signs and other crude geometric symbols. (For instance, in 2008, a picture of a Thylacoleo - a fierce "marsupial lion" that lived in Australia until it became extinct about 44,000 BCE - was discovered on the north-west coast of the Kimberley, suggesting that the painting must have been created during the early Upper Paleolithic.) All these types of ancient art are believed to predate the Last Glacial Maximum (c.24,000-18,000 BCE). However, as with Burrup Peninsula rock art in the Pilbara, and Ubirr rock art in Kakadu National Park, Arnhem Land, only a tiny fraction of Kimberley's rock art has been examined and dated, so it is impossible to say whether it begins in the era of Upper Paleolithic art (40,000-10,000 BCE), or Mesolithic Art (about 10,000-6,000 BCE) or Neolithic Art (about 6,000-2,000 BCE). New scientific dating methods are now being used to determine the ages of Bradshaw paintings, including Accelerator Mass Spectrometry (AMS), Uranium-Thorium dating (U/Th), and Optically Stimulated Luminescence (OSL). As it happens, OSL was employed to date a mud wasps's nest which overlay a Bradshaw picture. The nest was OSL-dated to 15,500 BCE, which meant that the picture was at least as old, if not older. However, archeologists continue to uncover oddities. For instance, about 13,000 BCE, the Aborigines in the Kimberley stopped using multi-barbed spears and started using stone pointed spears. However, this important change in hunting weaponry is not illustrated in any Bradshaw painting, suggesting that the tradition may predate the spear-change. See also the Nawarla Gabarnmang charcoal drawing in Arnhem Land, Northern Territory, the oldest cave art in Australia, which has been carbon-dated to 26,000 BCE. Bradshaw art bears little or no resemblance to any style of painting which predates it in the Kimberley sequence, and there is no hint of any connection between it and any preceding iconography or culture. 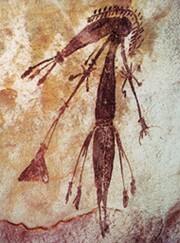 Some eleven types of anthropomorphous images have so far been identified as being related to the Bradshaw idiom - each reflecting significant cultural change - while the huge variation in the weathering of the pictures, allied to their wide distribution, seems to indicate that the Bradshaw culture dominated the Kimberley region for an exceptionally lengthy period. NOTE: To appreciate how Bradshaw paintings fit into the evolution of Stone Age art around the world, see: Prehistoric Art Timeline (from 2.5 million BCE). The term "Erudite Epoch" was used by Dr Walsh to embrace two art periods: (1) the Bradshaw Period, divided into: Tassel figures, Sash figures and Elegant Action figures; and (2) the Clothes Peg Figure Period. It is believed that distinctive apparel changes indicate that the artistic change accompanied a significant and widespread cultural change. During this era, aboriginal artists showed a clear preference for a certain kind of rock surface - namely, a vertical rock face made of hard, smooth rock. Only on this type of "canvas" could they demonstrate the exceptional linework control and intricate detail that characterizes the typical Bradshaw composition. In addition, the focus swiched from pictures of animals (or occasional solitary, naked humans) to pictures of elaborately dressed human figures portrayed in groups. Note: For the best examples of Aboriginal finger fluting, please see: Koonalda Cave Art (18,000 BCE). Bradshaw paintings predominantly portray human silhouettes which appear to "float" in mid-air, or are involved in dancing, running, hunting or dancing. Gender is rarely distinguished but limb and shoulder muscles are typically well defined. Although Joseph Bradshaw described the paintings as incorporating shades of blue and yellow, most Bradshaw figures have a deep purple-red or mulberry colour, or a red-brown colour. In addition, there are rarer examples of polychrome figures. (See also: Prehistoric Colour Palette.) Figures in Bradshaw pictures are typically between 40 and 50 centimetres in height (about 18-22 inches), rising very occasionally to 2 metres (about 7 feet). 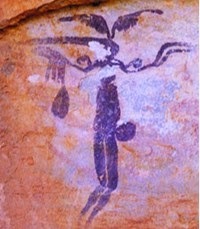 The images' fine detail and line control, with strands of hair being painted as thin as 1-2 millimetres, suggests that feather quills may have been used to apply the paint to the rock surface. Traces of a feather discovered at one site tends to confirm this hypothesis. These figures are characterized by the distinctive tassels hanging from their arms and waists, as well as their arm bands, conical-shaped headdresses and Boomerangs. This idiom is the earliest, most detailed and most extensive of Bradshaw styles. It emerged fully developed with no warning. No other styles have been found underneath a superimposed Tassel Bradshaw, suggesting it was definitely the first of the line. Although rather static, tasselled Bradshaw figures possess the greatest, at times bizarre, variety of decorative ornaments, such as arm bands, elbow bands, chest bands, bangles and anklets, as well as a range of cords, ribbons and tassels suspended from the shoulder or underarm. The specific "Triple Tassel" is so common that it acts as an immediate identifying mark for the style. Headdress forms tend to be more naturalistic than those in the Sash Bradshaws. The extent of these decorative appendages has led to these images being known as "ceremonial figures". Although similar in appearance to the Tassel Bradshaws, the Sash figure tends to be more robust, with smaller legs and feet, and wear a different mixture of accessories, as well as a wide variety of Dunce Cap headdresses. In addition, all varieties of elbow bands vanish, while all upper armbands are superceded by a single form of "Tuft Armband". But the biggest change was the replacement of the triple tassel by a "Three Point Sash", after which the style was named. Sash artists demonstrated a new mastery of the profile shoulder perspective, a technique which had long eluded the Tassel artists, which led to an increase of profile views. Also, detail of hands is replaced with small circular knobs, although weapons and other artifacts are now clearly shown as being held in the new round hands, rather than being aligned with the forearm, or placed next to open fingers. The slightly static character of the Tassel Bradshaw figures has now disappeared, to be replaced with more movement. Indeed, of all the Bradshaw figures, Sash Bradshaws are the most likely to appear in some type of ceremony or dancing. These figures are quite different from the Tassel and Sash Bradshaws, in that they are almost always depicted kneeling, running, or hunting with boomerangs and barbed spears. Moreover, the position of this style is difficult to pinpoint in the Bradshaw chronology, because they are the only figures that are not painted over earlier works, and no other figures are superimposed over them. As the name suggests, these Bradshaws are typically involved in some kind of activity, notably hunting scenes. Elegant Action Figures tend to be miniature in size and painted in monochrome. Their standard form is fairly basic and undecorated. There are far more males shown, than females. Men are often armed with short multi-barbed spears and boomerangs. They have two main types of headdress: a simple Dunce Cap tipped with a pompom, or a sweptback Watusi headdress. Elegant Action Figure women are typically portrayed taking part in ceremonial or everyday activities. The advent of Elegant Action Figures, with their active hunting lifestyle, lack of accessories and ornamentation, seems to reflect another major change of environment and lifestyle. As though life suddenly got harder. Curiously, this period also sees the first regular appearance of half-animal, half-human creatures, often armed with normal human-style weaponry. This style of Bradshaw painting is also the first to incorporate abstract signs (eg. dashes) in order to represent motion and action. Dashed lines surrounding a wound caused by a spear either represent "blood-splatters" or else are "action indicators" of the weapon's impact. Artists also employ exclamation lines next to the mouths of people and animals, to represent voice or call sounds. In addition, artists demonstrate a better grasp of naturalism and linear perspective. Interestingly, while almost all types of Bradshaw paintings have suffered significant vandalism, Elegant Action Figures have been left completely unscathed. This period is a discrete development from the Bradshaw Period. Its figures were named by Walsh after their resemblance to wooden clothes pegs, although other historians use the term "Straight Part Figures". Typically portrayed in a stationary posture and painted with red pigment, parts of their bodies (arms, feet, waists) sometimes appear to be missing. This is due to the fading of the white and yellow colour pigments. Figures sometimes adopt an aggressive stance, and are often armed with multi-barbed spears. They continue to represent real people rather than gods or ceremonial deities, but with increasing degrees of schematization and artificiality. Variations of this idiom include: the "Static figure", the "Stick figure", the "Classic figure" and the "Tapering Outline figure". These figures can be seen in a large number of images, suggesting that the Clothes Peg idiom was the work of either a huge number of skilled painters over a relatively short period, or a smaller number of artists over an extended time period. Weathering effects indicate the latter. For another set of extraordinary human figures, see the famous Addaura Cave engravings (11,000 BCE), discovered near Palermo in Sicily. Who Painted the Bradshaw Rock Paintings? One of the great mysteries concerning the Bradshaws is why they are so distinctive, so sophisticated and so different, as a whole, from other Australian rock art. Mindful of this, as well as the similarities between Bradshaws and the rock art of Africa (north and south) and central India, Walsh gave this issue considerable thought, and came to a very radical conclusion. He believed that the Bradshaws were painted by outsiders, who arrived, painted their pictures and then left. He thought that these outsiders were separate from the ancestors of contemporary aborigines. Unfortunately this viewpoint lacks any logic. First, Arnhem Land rock painting includes a style of Dynamic/Mimi figures, which have many similarities with Bradshaw pictures in the Kimberley. This resemblance is so widespread and so specific that some scientists believe that these two regions were once part of a single zone of rock art. In other words, Bradshaws are not so completely unique. Second, Bradshaw paintings (and those in Arnhem Land and most other places in Australia) remain largely undated. Without an established chronology, very few conclusions can be drawn about the development of a particular style, especially when compared with other styles which may or may not be contemporaneous. Third, archeological evidence suggests that Bradshaws were created over a very long time-span. But if Bradshaws were painted over a period of 15,000 or more years, it is almost inconceivable that they were created by an "outsider group" who then disappeared whence they came, leaving no archeological trace of their habitation during a period of over fifteen millennia.  For more about prehistoric painting in Europe, see: Cave Painting.  For details of rock scratchings, see: Petroglyphs.  For engraved drawings, see: Prehistoric Rock Engravings.  For ancient arts and crafts in the South Pacific area, see: Oceanic Art.  For more information about Aboriginal painting in Western Australia, see: Homepage.